This lovingly restored 1850's bluestone whaler's cottage has been fully renovated. It has the comfort of the 21st century living whilst maintaining the charm and atmosphere of the 19th century. 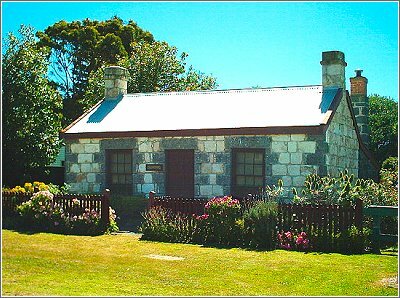 Only 150 metres walking distance from the Eastern Beach, the cottage is ideally located for walks through the Botanic Gardens and along the picturesque Moyne River. The cottage is fully self contained. The spacious kitchen is fully equipped with a gas/electric stove, a microwave, a dishwasher. Cutlery, crockery and saucepans are provided. The large kitchen table seats 6 and has a charming outlook over the back garden. Full laundry facilities are provided. The garden at Tara Cottage has been developed and lovingly tended over many years. There is an outdoor area behind the cottage which has complete privacy. The rich colours in the garden and surroundings create a lovely tranquil atmosphere.